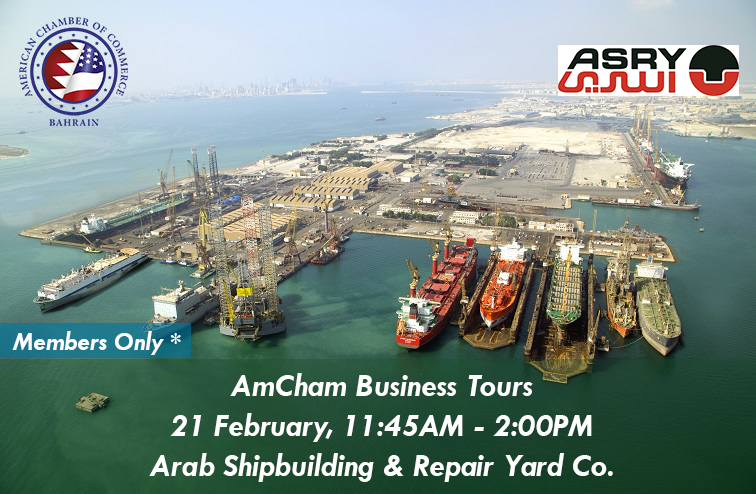 ASRY has invited AmCham for a guided tour and introduction of the company's operations and facilities, including a meeting with the CEO, a bus tour of the yard and lunch at the company's premises. ASRY is the Arabian Gulf’s most experienced ship and rig repair yard. Founded in 1977 in Bahrain, ASRY has over 35 years of experience in marine asset optimization. Its leading range of facilities includes a 500,000dwt dry dock, two floating docks of 252m and 227m in length, 15 repair berths with a total length of approximately 4,000m, twin 255m slipways, as well as a full range of workshops and service centers. This event is for members of AmCham Bahrain only. Date & Time: Thursday 21 February, from 11:45 AM - 2:00 PM. Venue: Arab Ship Building & Repair Yard Co, Al Hidd. Click here for directions.